The vast white dunes of White sands National Monument in New Mexico present themselves best in the light of sunset or sunrise. We were lucky to have a break in the clouds after an afternoon of thunder storms, providing some spectacular light on the soft ripples and formations of the dunes. 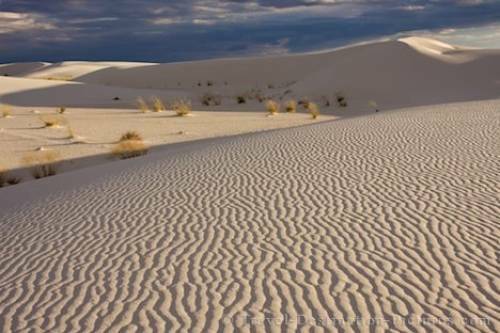 Picture of ripples and formations in the pristine sand of White Sands National Monument in New Mexico, USA.